At a press conference held the day after the passage of the new City budget, Austin Interfaith leaders celebrated a historic living wage win and other 'budget priorities' that were included. Austin Interfaith leaders thanked the Mayor and specific council members for acting as "budget champions." As a result, the City of Austin will now pay their workers an increased living wage of $13.03 per hour (up from $11.39) and for the first time will include temporary AND contracted workers in that wage standard. Workers employed for at least 12 months will additionally qualify for healthcare benefits. Employees of private corporations receiving public subsidies will also benefit from the wage increase. Leaders celebrated additional wins in areas impacting workers, children and families: $350K in increased investment in long-term job training program Capital IDEA, $3 million in added investments in parks, pools and libraries, $684K for AISD parents support specialists, $520K for Primetime after-school programming, and at least $1.6 Million for property tax breaks for seniors and disabled homeowners. Texas IAF organizations in San Antonio, Austin, and El Paso are at the forefront of potential living wage victories for county and city employees. Due to the work of COPS / Metro Alliance and Austin Interfaith, the cities of San Antonio and Austin are on the verge of passing proposed budgets which would increase wages from more than $11 per hour to $13 per hour. Bexar County and El Paso County also have upcoming votes to raise the wages of county workers from $9.45 to $10 in El Paso and from $11.66 to $13 in Bexar. Graphic to the right shows the relative impact of this wage work . In a dramatic reversal of her position on living wages, Mayor Ivy Taylor threw her support behind COPS / Metro's proposal to raise the minimum the City pays its employees from $11.47 / hour to $13 /hour. Taylor threw in her support days after City Manager Sheryl Sculley included the measure in the proposed budget for the City of San Antonio. This raise will directly impact 1,300 - 1,500 City employees who, in the words of Councilmember Ray Lopez, might no longer "have to have a second or third job." An additional 1,500 workers would indirectly benefit through wage compression, in which those currently earning close to $13 / hour will also see their wages rise. Las Milpas, TX - A culture of disrespect towards Las Milpas residents had become so pervasive that when Valley Interfaith leaders sought funding for a local library last year, the Mayor declared: " is not a Whataburger where you pull up and give your orders....use the school library." The disrespect extended to leaving streets unpaved in the colonia over two decades and turning a blind eye to the 4-hour bus commutes of UT-RGV college students as they trudged on foot over a mile to the nearest stop. Rather than let the City's response deter them, leaders used the disdain to fuel a 7-month electoral brawl including a Get Out The Vote strategy that ultimately replaced the Mayor and deposed dismissive officials. 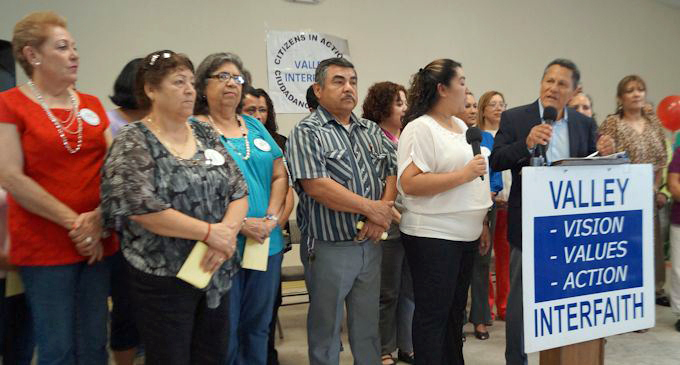 Valley Interfaith leaders Eddie Anaya, Claudia Garcia, Monse Martinez, and Mauro Hernandez launched a campaign to change the power structure in Pharr, starting with meetings held in homes and at churches. Says Anaya, "We knew, with Valley Interfaith, there was only one way to do this." On Monday at 8am, faith leaders across Texas arrived at the Capitol to fight Senate Bill 185, which would outlaw sanctuary cities in Texas and threaten local efforts to build better relationships between police and communities. Sponsored by State Senator Charles Perry, from Lubbock, the bill would prohibit cities from forbidding police to enforce immigration laws.